Splattered leaves make Polka Dot Plant an unusual and attractive house plant. Many are pink, however newer hybrids are available with red or white spotted leaves. This bushy plant grows quickly with good light. Pinch back growing tips often to encourage branching and to keep the plant compact. Insignificant purple flower spikes may appear. Pinch them off because they detract from the foliage and can cause the plant to deteriorate after blooming. Shed some light. Leaves may revert to solid-green in low light. Put your plant where it'll get plenty of light, but out of direct sun. Filtered light from a south- or west-facing window will give it the light it needs. If you move your plant outdoors for the summer, keep it fully shaded from hot sun, which can cause leaves to curl up and develop brown scorch marks. Keep up the humidity. If relative humidity drops below 50%, use a humidity tray or room humidifier to increase the moisture in the air. Grouping plants also helps to maintain the humidity around them. A terrarium is an ideal home for this humidity-loving plant, where it will add eye-catching color among green foliage plants. Water regularly. Keep the soil lightly moist, but take care not to overwater. Too-dry soil will cause leaves to wilt and drop off. Quickly revive a wilted plant with a thorough watering. Soggy soil will cause the leaves to turn yellow. Pinch your plant. Pinch off tall stems to prevent the plant from getting too leggy. Also, pinch off growing tips to encourage stems to branch out for a fuller, bushier plant. Height: Keep to about 10 in (25 cm) by pinching off. 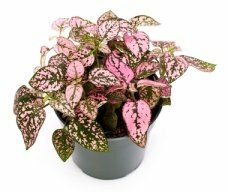 Light: Polka Dot Plant will lose its variegation in low light. Give your plant plenty of bright, indirect light for sensational color. Protect plants from direct sun to prevent scorching leaves. Water: Keep soil evenly moist spring through fall and slightly drier in winter. Humidity: Likes moist air. Use a cool-mist room humidifier or humidity tray. Check out these easy ways to raise the humidity for your houseplants. Propagation: Grows easily from seeds. Take stem cuttings in spring and early summer.